"A co-worker couldn't decide on her favorite for her birthday treat, brownies or chocolate chip cookies, so she said I should just pick one. On the way home I thought this up and couldn't find it on Allrecipes so I created it. These go quickly; I usually make a double batch in a jelly roll pan." Beat softened butter, light brown sugar, 1/4 cup white sugar, and 1/2 teaspoon vanilla extract together in a large bowl until creamy. Add 1 egg; beat until light and creamy, about 2 minutes. Whisk 1 1/4 cups flour, 1/2 teaspoon salt, and baking soda together in a bowl. Gradually stir flour mixture into butter mixture until dough is combined. Stir chocolate chips into dough. Spread dough into the bottom of the prepared baking dish to cover completely. Stir 1 cup white sugar, melted butter, and 1 teaspoon vanilla extract together in a bowl; add 2 eggs and beat well. Mix cocoa powder into butter mixture until well-combined. Stir 1/2 cup flour, baking powder, and 1/8 teaspoon salt into cocoa mixture until batter is combined. 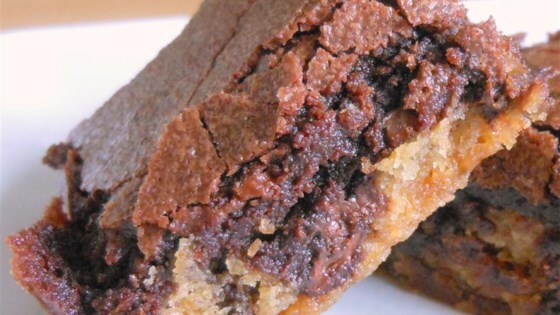 Pour brownie batter over cookie dough and spread to cover completely. Bake in the preheated oven until a toothpick inserted into the center of the brookies comes out clean, 20 to 25 minutes. Cool completely before cutting into bars. You can use store bought chocolate chip cookie dough instead of making the cookies. Have this recipe in the oven, and it is baking over the sides of the jelly-roll pan(13 1/2 x 15) and burning on the bottom of the oven . Very good, yummy recipe. I'm not sure why, but this took about 40 minutes to finish baking rather than the time specified.